"Twinkle, twinkle, little bat! How I wonder what you're at!" 'You can draw water out of a water-well,' said the Hatter; 'so I should think you could draw treacle out of a treacle-well—eh, stupid?' 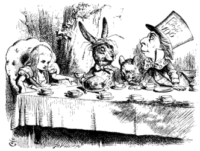 'But they were IN the well,' Alice said to the Dormouse, not choosing to notice this last remark. 'Of course they were', said the Dormouse; '—well in.' This answer so confused poor Alice, that she let the Dormouse go on for some time without interrupting it. 'Why with an M?' said Alice. 'Why not?' said the March Hare.